I ask for your prayers as Fr. Carmichael, Andrew DaPonte, John Presley and myself embark on a spiritual pilgrimage with young people from all over the world to the 2019 WYD. We will carry prayer intentions from you, our loved ones and those universal prayers for the whole world. Please send us your prayer intentions this week since the three of us will begin to travel on the 19th. These prayers will be entrusted to the intercessors selected as patrons for this WYD event. The saints and blesseds chosen to pray for pilgrims are often known for a commitment to youth, or for a connection to the host country or region. The Patron Saints for WYD Panama are: St José Sánchez del Rio, St. Juan Diego, Blessed Sor Maria Romero Meneses, St. John Bosco, St. John Paul II, Blessed Oscar Arnulfo Romero, St. Martin de Porres, and Saint Rose of Lima. 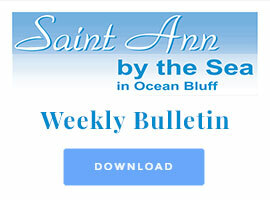 Please be assured of our prayers for all of your intentions and for all the parishioners of St. Ann by the Sea!